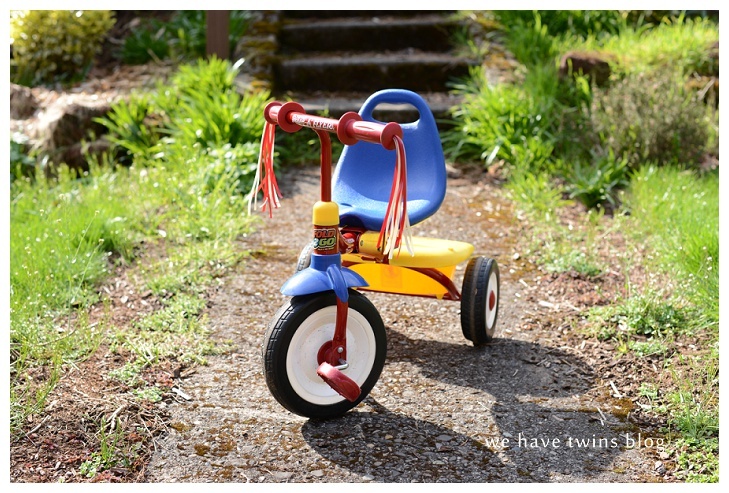 February | 2015 | We Have Twins?! Last fall, I came across this article (10 Things Your Mom Never Told You) on Facebook, and it really rubbed me the wrong way. It’s that treacly stereotypical garbage that obviously means I’m an absolutely terrible mother. In fact, I’m such a bad, lazy mom that it’s taken me four months to actually get around to sharing my response. Okay, yes, totally. Completely. There have been a lot of tears on my end. Anxious ones, happy ones, inexplicable ones. Even now, if I look long enough at them, they’re so sweet that I tear up. What?! No way, man. I’ll give you a bite, sure, but that pie is mine! Oh, yes, I’ve had fears in the back of my mind since we found out about them. So many, too many sometimes, and they’re not even in school yet. Eh. We have two babies. We’re doing it all wrong, probably. Ain’t nobody with two babies got time to worry about being perfect. DUDE. I am not spending even more time NOT SLEEPING than I need to. I will hold and comfort and soothe (and I still check to make sure they’re breathing, more than two years in), but then I go BACK TO BED. Like a normal human person. 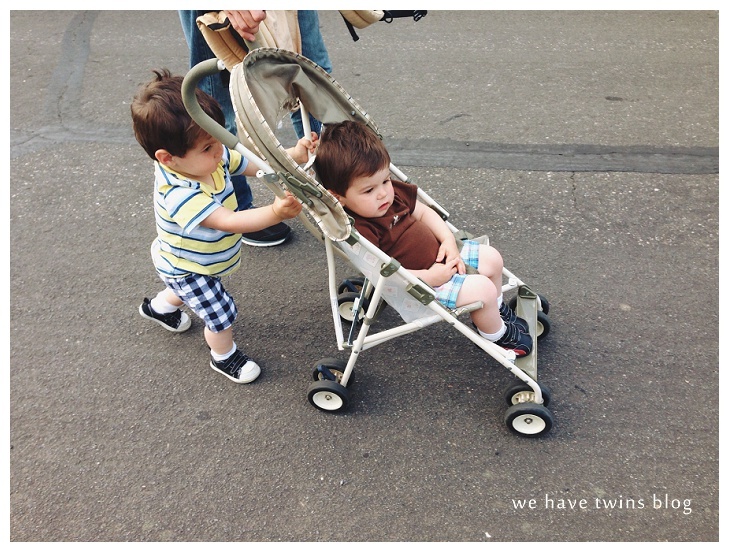 Maybe this is a twin thing, because once they’re older than a few weeks, it’s nearly impossible to hold two babies at the same time. And now, when there are two thirty-pound toddlers demanding to be held (“up! UP! UP! !”), there is no physical way for me to do that. I have to put one down, or sit on the floor/couch, or put one in an Ergo. And I can’t carry even one for very long anymore, either. I guess I haven’t earned my mama stripes if I am unable to carry a baby more than a certain amount of time. Am I not allowed to be a mother if I give in to an aching back? Every time? Every time? Really? You sure about that? When one of them falls and bumps his head–absolutely! Poor sweet baby, come here and let me make it all better. But when it’s 4.30am and it’s the fourth wake-up of the night and you just want to sleep, for the love of all that is holy? Nope, nothing shattering over here. Let me give you a hug and then PLEASE GO TO SLEEP. I hate this idea that mothers are “supposed to” sacrifice everything for their babies, and love it. That mothers’ lives aren’t meaningful on their own, that somehow being hungry is a badge of honor of maternal pride and accomplishment. I *do* shower, and sleep, and eat. I don’t think that should be special or unique, either. (I also wear pajamas most of the day. Nothing wrong with that!) All mothers need and deserve to do basic biological things like eat, for god’s sake. I’ve said before–and I think it’s RIDICULOUS that it even needs to be mentioned–mamas are people too, and mama, YOU MATTER. Go wash your hair, go take a nap, go finish that pie–you deserve it!! My little toddlers run grinning into my arms when I pick them up from daycare, and they have also just recently started to say, “I lub you, mama,” and dammit, there goes my heart shattering every time. So maybe I’m doing something right after all? 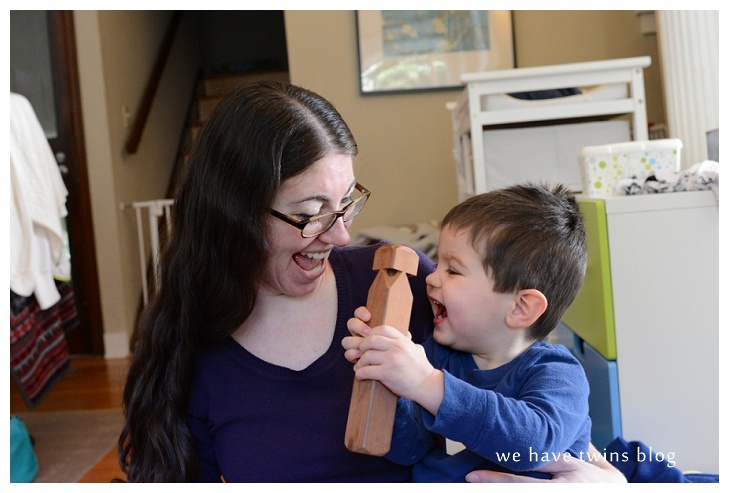 Also, FYI: Baby Cheapskate does an annual roundup of “Toys that get played with” for all age ranges, based on reader polls/surveys. Here’s the 2013 list for 13-24 months. You should follow them on Facebook--they find and post tons of deals on baby gear every day! 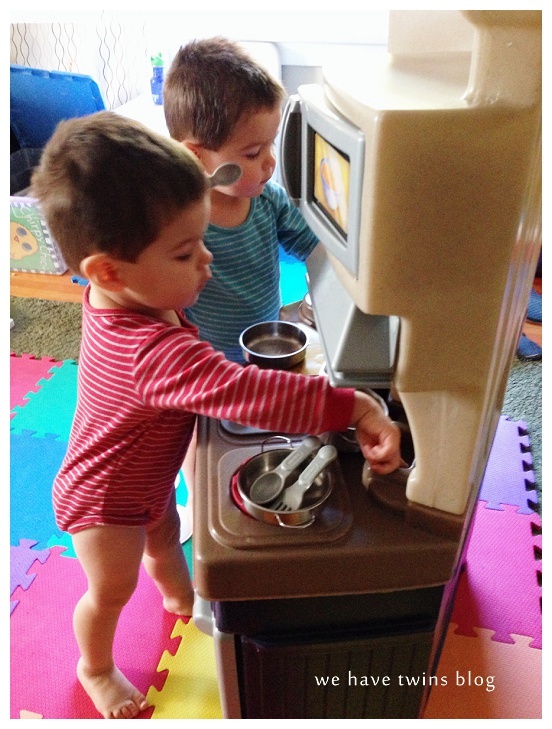 Play Kitchen: We received one when they were about a year old, and kept putting off putting it together until they were a little older. 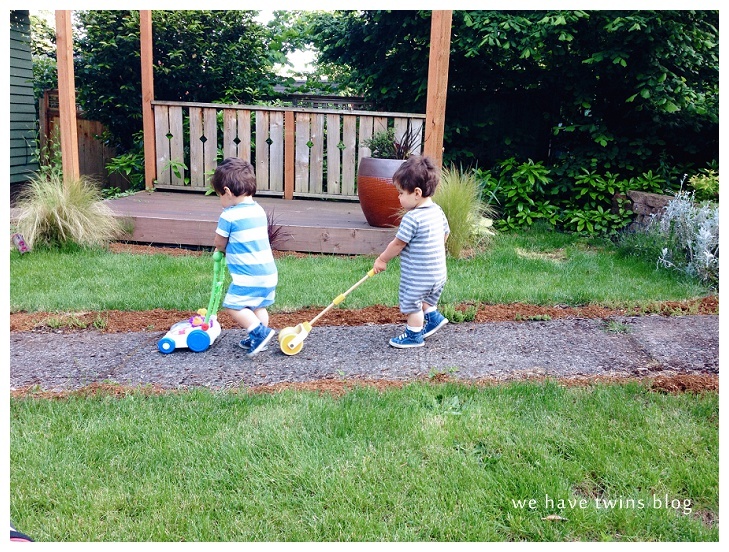 We finally did it when they were 23 months, and oh my goodness, THEY LOVE IT. 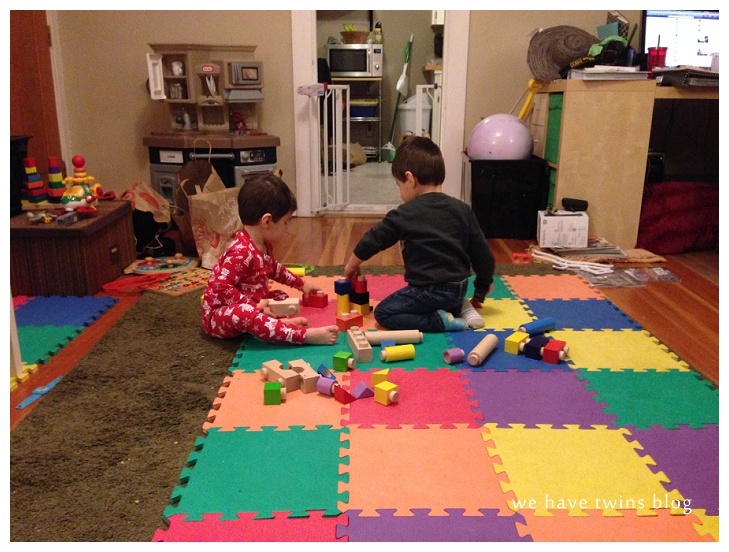 I’d meant to move it upstairs to their room, but they play with it just about every day here in the living room. They LOVE it. And they probably would have loved it just as much a few months earlier! It is so much fun to watch them play pretend, and it’s so freaking adorable I can’t even stand it. 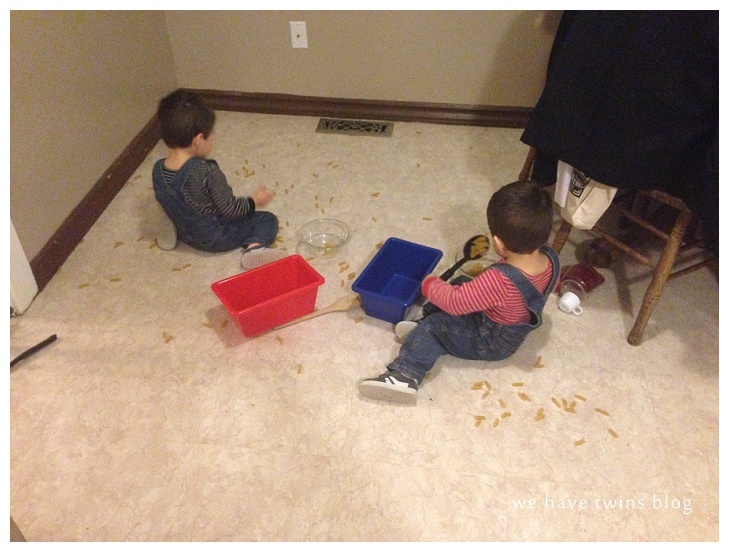 Spoons, empty containers, dried pasta or beans: Part playing pretend, part sorting and pouring, and part percussion practice. We have a bunch of empty oatmeal canisters that they can play with, and we give them real spoons and Pyrex bowls, and they “stir stir stir” and scoop and stir. 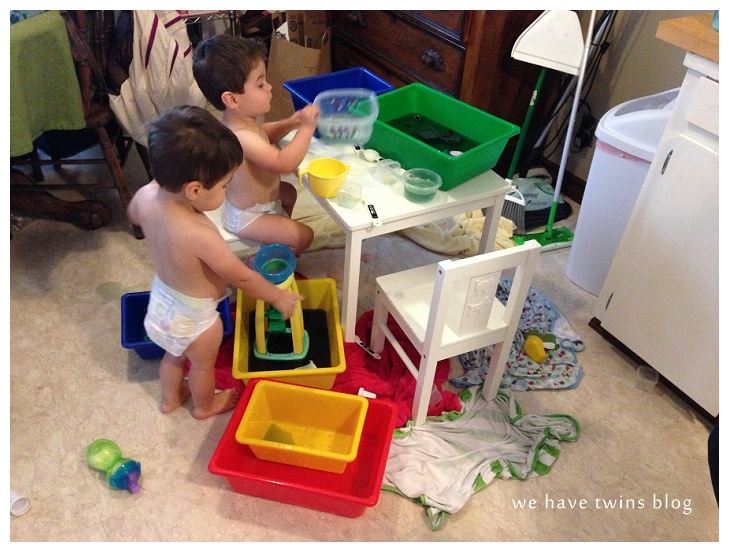 If they have some they can pour and scoop and move between one place and another–water, dried beans, dried pasta–they will play with it for a loooong time, very happily. The umbrella strollers work very well too! 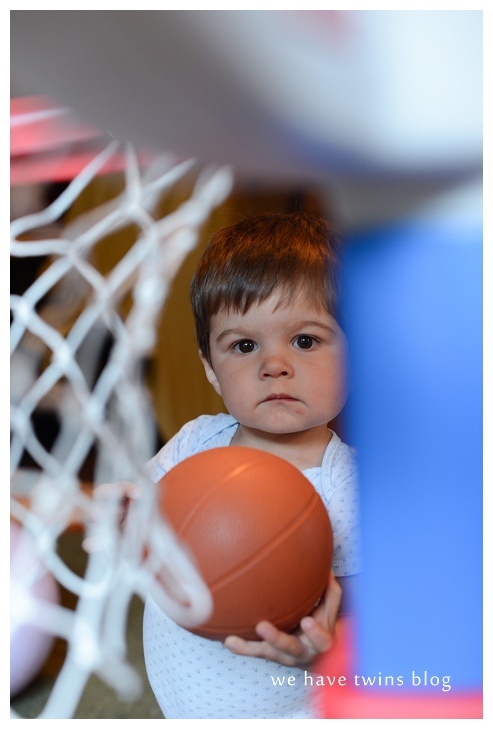 Basketball hoop and other athletic stuff: The basketball hoop is a lot of fun, but even when that’s not out, they’ve enjoyed played with the mini basketball and a couple other balls we have. They figured out kicking and dribbling balls, so the soccer ball was a good addition. I also had two cheap frisbee-type things, which they love to play with and throw. Good for headwear, beach trips, and generally collecting things. Gathering and unpacking is a big thing for them. 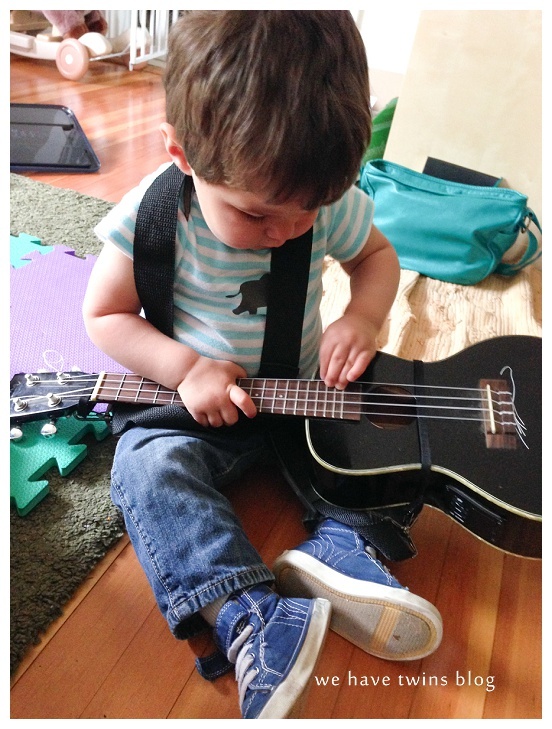 Baby Guitar/Ukulele: Our nanny (who is in a band) sometimes brings her ukelele and sings to them, and lets them play with it. They will happily sit on their baby couch together, strumming and swaying back and forth. They never ever want to stop playing, and anytime it’s been here, they ask, “More le-le?” over and over again. This is my secret weapon toy. If I need them to chill out/I’m out of ideas/they’re stir-crazy, they get to play with Mama’s wallet! 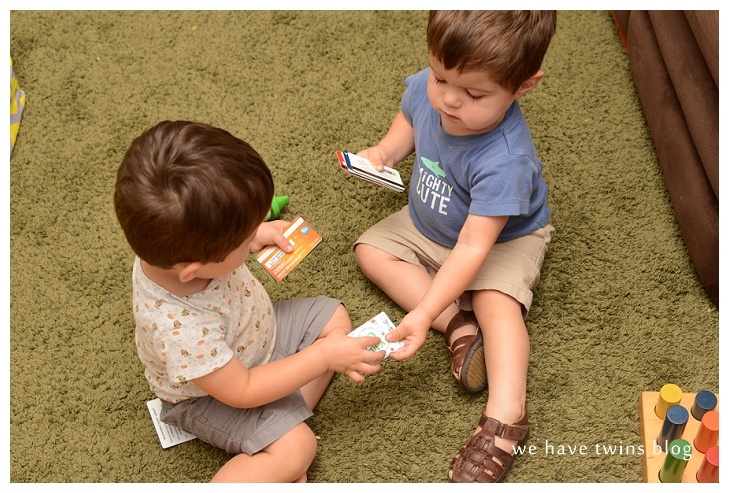 They methodically take all the cards out and then play with putting them back in and handing them back and forth to each other. I don’t get it, but I’ll take it! 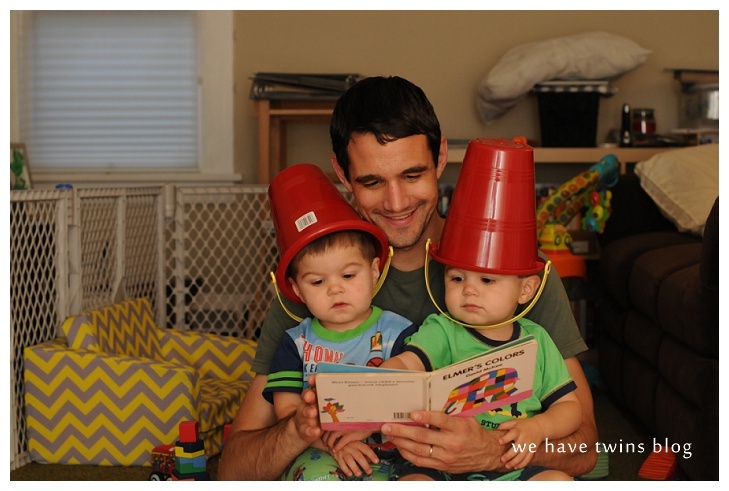 I’d love to hear what your young toddlers love to play with–leave a note in the comments!